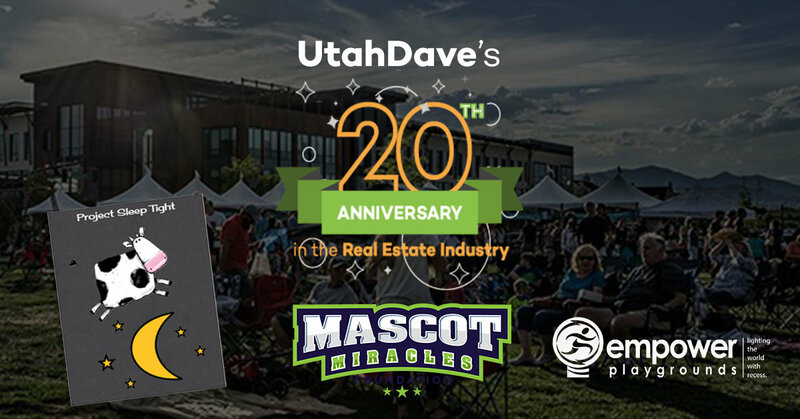 2019-2020 is UtahDave's 20th year in the business! To honor our clients, we will be giving away $20,000 to charities and clients. Upon the 100th goBE closing, we will donate $5,000 to the top charity, $3,000 to the second place charity, and $2,000 to the third place charity. Upon closing, our clients will be asked to choose their top charity between the following three charities: Project Sleep Tight, Mascot Miracles, and Empowered Playgrounds. Throughout the year, goBE will continue to give away $10,000 through various contests—and will end our celebration bringing in the New Year 2020 with a HUGE 20th Anniversary client celebration filled with food, dancing, prizes, and more.